How To Save Money on a Low Income: The Struggle is Real! 1. Change your money mindset. 2. Earn free gift cards to reduce your spending! 3. Create a fail-proof budget that works for you. 4. Get a personal finance robot to trim your expenses. 5. Reduce your food expense. 6. Here are other quick ways to cut costs and save money on a low income. Inspire yourself to learn from others who are more successful than you! 7. Learn how regular people (or even low-income earners) became millionaires. 8. Follow Warren Buffett’s financial wisdom. Make extra money during your spare time. Can you really save money on a low income? Ask this janitor who quietly amassed an $8 million fortune! Yeah, no kidding! Today is going to be a special post that’s a little different since my blog doesn’t concentrate on extreme frugality. My past posts about how we amassed over $750,000 in 7 years inspired a bunch of my readers. But after finding out that 78% of Americans are living paycheck to paycheck, I realized that it may not resonate with some people (and 78% is A LOT of people!). Gosh, even some people who make over $100,000 per year are living paycheck to paycheck let alone the ones who are struggling to save money on a low income! I cannot hide the fact that our combined income is higher than average, but back in 2010, my fiance and I started with a one-income salary of $31,000 (~$15 per hour). The struggle is real and we know how it feels! Most of our wealth today is not because we saved every little penny we earned in the past. I honestly cannot imagine doing that! Yes, it became easier to save money as our combined incomes grew, but most of our wealth today comes from the investments we consistently purchased over seven years ago. I also cannot hide the fact that we also got a little lucky with the strong stock markets since the last recession! Though I am a HUGE fan of making money work for you, this post isn’t about amassing your wealth through savings and investing. You can learn more about how to invest for dummies here. Today, I want to give you tips on how to save money fast on a low income or how to live well on one income. Aside from starting off with a single income of $31,000 ($15 per hour) before taxes, we both know what it’s like to be “poor” because we grew up in very low-income families (try living off less than $15,000 per year with a family). Overall, I hate talking about myself and this post really isn’t about me or where I came from. But since more than 77% of my life has been living on a low income, I want to help you manage and cope with it without going nuts! – rent in an apartment located in an area with a high crime rate (ever witnessed stabbings from your balcony window?). – reside with a few roaches and rodents (I really don’t miss those days of seeing Mickey without having to visit Disney World!). – eat at home all the time (there’s no such thing as going out). – take “hand-me-downs” from your friends and family who are financially better off than you. – rely on some government aid. Growing up in a low-income family, I would always hear my dad complain about us being poor. What I’m about to say may sound odd, especially when this comes from someone with the lowest income bracket, but my dad would never go out of his way to save money or build wealth. He thinks being frugal and saving money is a complete waste of time and doesn’t produce any real results (Hint: he thinks it’s cheap and I’m not sure why he thinks that). He would talk about how climbing a corporate ladder, building a successful business from scratch, or investing in the latest and hottest real estate trend is what makes you rich. Okay, he talks and talks about it ALL the time, but where’s the action? Instead, he would generally have something or someone to blame (i.e. a bad government or being born unlucky) or come up with some excuse for our misfortunes. Now, I love my dad to death and I am not here to talk about him. In fact, it’s his complaining that helped me build wealth today. Well, if there’s one thing I learned from him, it’s that complaining and coming up with excuses (which most people do) will get you nowhere! Once I realized that complaining, blaming and coming up with excuses of why I’m poor was the real root of our problems, I took action and did exactly the list below to save money, make money, and build wealth. I started off doing this while still being in the low-income bracket. Mind you, my dad and others used to laugh at me while I was saving money, investing, and hustling away, but I ignored them and did my own thing. They thought it was too slow since the results weren’t instant (BTW, they are still complaining and in the same position today). I still continue to save, invest, and make extra money during my spare time, so despite being a low-income or high-income earner, anyone can follow these steps and find success in saving money and building wealth over time. Here are fail-proof ways to save money on a low income (or any income). This is the first and most important step that you need to achieve. I can almost promise you that once you get through this step, you’ve already won 50% of the battle! The other 50% is setting realistic goals and taking action. I was like my dad with a gazillion excuses for why we live a poor life. But once I stopped believing that I was the victim and started taking action, my life along with my finances improved significantly. opened up my mind to a world of abundance! So, the first and most important thing you need to do is to change your mindset. Just because you are living on a low income, doesn’t mean that it has to last forever. Make changes today by keeping an open mind. For example, be willing to find ways to save smart and make extra money during your spare time. Most people won’t do this because they are lazy AF (or come up with a million excuses) but want instant results. I know you are not that person! You are the driver of your car and you can choose your direction. Believe me, you have control. It’s just a matter of whether you want it or not. Related post: 10 Ways To Increase Your Chances of Becoming Rich — #10 is Seriously Mind Blowing! These free money-saving apps are perfect when you are looking for ways to save money on a low income. It will help you make some room within your budget without having to sacrifice some of the things you enjoy. If you’re ever feeling a little tight on cash, I recommend joining these best survey sites to start collecting free gift cards to your favorite shops. Membership is always 100% free! This may help you save money especially when you’re on a low income. I was able to redeem free gift cards to the stores I normally shop at, so this definitely helped me when I found it hard to make ends meet! How it works is you get rewarded with cash through PayPal or free gift cards just by doing the things you normally do. That includes surfing the net, playing games, shopping online, and completing easy surveys. Most of the survey sites I recommend offer gift cards to your favorite shops such as Amazon, Starbucks, Walmart, Target, and more. Click here to get your free gift cards today. – 30+ Places To Get FREE STUFF on Your Birthday (Over $150 Value for FREE)! It’s time to create a budget for low income earners and still live rich on a small income! I’ve mentioned over and over again that we used to watch Gail Vaz-Oxlade’s money makeover shows. She’s really good at teaching you how to survive on a low income budget! Her fail-proof budgeting strategies helped us amass our wealth to over $750,000 today! Again, I have to admit that our income increased over the years and that our investments did well due to the strong stock markets. I am not going to hide that. However, Gail’s weekly and monthly budget planner was the foundation to what we needed to grow our net worth at our own pace! Results will vary but you need to stick with it and make it a part of your lifestyle to really see results! – knowing exactly where your money goes and how much you are spending. – building momentum when you are on track with your weekly goals (baby steps, girl!). – creating a plan so that you are not surprised at why you are in debt or living paycheck to paycheck (a budget can help avoid it). – knowing how much you can afford (this will motivate you to find creative ways to increase your income so that you can live and do more). We created our version of her budgeting strategy to help you keep track of your finances. It’s 100% free and only exclusive to my subscribers, so grab your budget template here. For more details about this budget kit, visit my post, The Free Budget Kit You Need To Conquer Your Finances. Do you find it hard to trim your expenses no matter how many unnecessary things you stopped purchasing? Well, I’m super excited to tell you that Trim can help you save money fast! He’s your personal finance assistant who can help you save money on a low income by trimming your unnecessary expenses! Trim is clever because he can negotiate your monthly bills FOR YOU (e.g. cell phone, Internet, cable, and more)! He will even cancel the ones you ask him to. Trim has saved their users over $1,000,000 in the last month! 👉 Sign up for Trim here for FREE and start putting cash back into your pockets! One of my favorite ways to save money on groceries is to shop sales and combine them with coupons plus cash back apps. These are clever strategies that anyone can use, especially those who are struggling to save money on a low income. One of my favorite grocery cash back apps is Checkout 51 because of how easy it is use! Each week, they will have new offers that are eligible for cash back. Quickly snap a photo of your receipts with those offers and redeem your check once your account reaches the minimum of $20. Click here to sign up for Checkout 51 for FREE and get a FREE $5 bonus after uploading your first few receipts. Studies also show that people tend to waste money at the grocery store when they shop on an empty stomach with no plan. 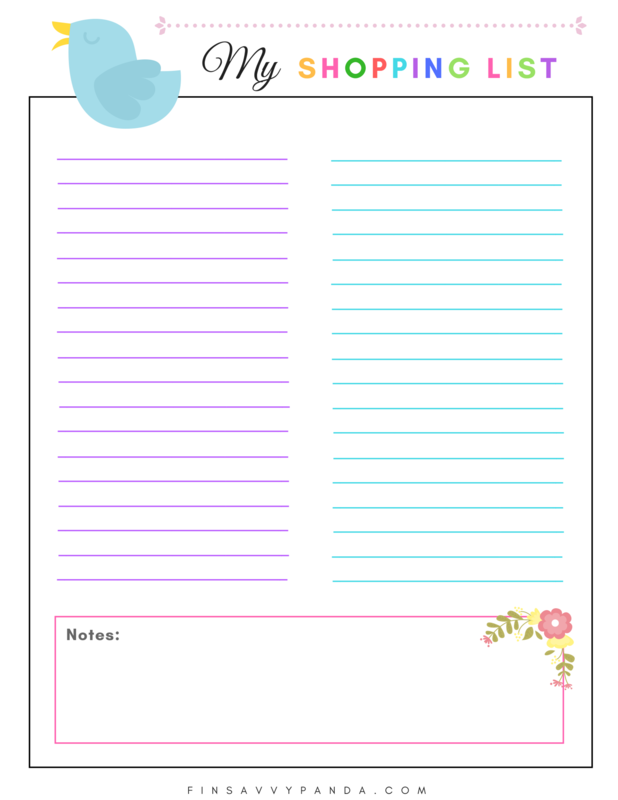 With that said, I made this free downloadable printable for you to write down your shopping list so that you can save money each time you go grocery shopping. – Reduce your ATM and overdraft fees. You need to take care of the low-hanging fruit first! – Get paid to save energy by using OhmConnect. YES, YOU READ THAT RIGHT! They will PAY YOU for saving energy which gives you the incentive to lower your bills. I personally use this free resource to save money each year. – Get your money back with Paribus. This free app does the price adjustments for you (there’s no effort from your end). When Paribus finds a price drop in your e-mail inbox, it will notify you and the retailer. Yes, Paribus will do all the work and YOU keep 100% of the savings! – Bring your own lunch. I used to spend $10-$15 on lunch every day and it’s no wonder why I was living paycheck to paycheck. Start packing your lunch more often and you will see what a huge difference this makes! – Pay your bills on time. The whole purpose is to avoid late fees. Oh, did I mention that I love to automate all of my bills? This saves a helluva time too!!! – Earn cash back to save money. I absolutely love using credit cards to get cash back rewards, but of course, don’t do this if you are addicted to using them. Instead, you can check out these free money resources that can help you save money on a low income. – Negotiate every bill you hate paying for. This includes your cable, internet, cell phone, home insurance, car insurance, gym membership and more! Read this article, Self-made millionaire Ramit Sethi: How to lower 4 monthly bills you hate paying. Ramit gives one of the best personal finance advice! to save energy and money at home. It definitely goes hand in hand with the free resource OhmConnect I mentioned above. – DIY and crafts. I’m a huge crafts fan and I love home decor and design. You don’t always have to buy the most expensive items to spruce up your place especially when you are living on a low income. Read how I refurbish furniture to save money on home furnishing. – Save money on meals. I was a member of this $5 Meal Plan and I really enjoyed it but had to cancel it because my parents want my fiance and me to join them for dinner every other night (it’s a tradition in our family). You may not be lucky like to me have parents who want you to go over for dinner, so an alternative is to try the $5 Meal Plan. They send you a weekly meal plan where each meal costs about $2 per person. I’ve personally tried this and it’s legit! The whole point is to help you save time and money! You can sign up for a free trial here for 14 days risk-free. – Price compare. Always do a price comparison to save money when you shop. Nowadays, it’s so easy to compare anything online just by doing a simple search. – Price match. Along with price comparing, you can price match all your groceries at one store. Be sure to price match at the grocery stores that allow you to. In Canada, Walmart and The Real Canadian Store is our main go-to. I love to use the Flipp app to price compare and price match! It’s so easy and convenient! – Frugal fun. I won’t lie. I hate the term “frugal” ONLY because people confuse it with cheap, but there are many smart ways to have fun without breaking the bank. Read here for frugal activities you can do during your spare time and weekends. – Start a blog. I’m not kidding here! I noticed that I was able to save so much money (and now making over $5,000 per month with this blog) since I started this project! I was skeptical at first but kept an open mind. Not to mention, starting this blog improved my mental health as well! You can start your blog through my free step-by-step tutorial here. Starting a blog only costs a few dollars per month plus you get a free domain if you sign-up through my tutorial. “Surround yourself with those who only lift you higher.” – Oprah Winfrey. Although I’m not surrounded by many positive influencers, I truly believe in these two quotes. And I really believe that this advice will improve your finances and your life! I’m not saying that my friends and family aren’t admirable, but most of them don’t believe in financial independence nor my view about living a fulfilling life. Yes, most of them will come up with excuses for why they cannot save or make extra money (and then complain about how unfair life is). Now, I’m not here to say who’s right or wrong — this is a personal choice. At the end of the day, I still admire and love all of them! But with no one who I could turn to, I basically stuffed my brain with facts about people who are financially successful and started following them for some solid financial wisdom (read points #7 and #8). is one of my favorite books because it has truly changed my life! I know what your first reaction is… “What the heck? Become a millionaire? I’m on a low income, with massive debt and living paycheck to paycheck.” See, those are excuses again. It sounds impossible to think about building wealth, but I want you to keep an open mind (that’s what I did) despite how far-fetched you think it seems. In fact, you’ll be surprised that most millionaires aren’t those who were given an inheritance. Like this janitor who amassed an $8 million fortune, it was the right saving, spending, and investing habits that led him to financial independence. Like I said, less complaining and excuses and more doing will increase your chances of achieving financial success. You’ll be surprised at how small changes in your daily habits today will compound into something massive tomorrow! Related post: How To Become the Millionaire Next Door Without a High Income — #1 is a hurdle but it will change your life! Before following Warren Buffett, I had a very poor mindset. I was also living paycheck to paycheck with a low income during that time. I don’t like talking about my past (because it sounds like I’m either complaining or humblebragging which I hate), but like you right now, I really thought that was going to be my life forever. Following someone who is financially better than you is a great way to motivate yourself, especially when you are struggling to save money and build wealth on a low income. I follow Warren Buffett by reading about him almost every day! – 5 Amazing Money Tips from a Billionaire That Will Help You Conquer Your Finances! – This Quote By Warren Buffett Will Inspire You To Become Rich! – This Multi-Billionaire Investor, Warren Buffett, is Frugal: Why Aren’t You? This may sound crazy, but I wake up each morning searching for his quotes on my phone. It’s what gets me going throughout the day. So, here’s my point, if you want to get out get out of a financial rut and start building wealth… Start surrounding yourself with the right people. It will do wonders for both your finances and self-development! There is one thing I absolutely love talking about and that’s making extra money during your free time. It can really help you save money on a low income! By the way, Warren Buffett was a true hustler since he was a child! You can read more about him in this post here. – 5 Legit Ways To Make Money Online — Learn how one person makes over $100,000 online every month! Over to you — how do you save money on a low income? Are you inspired to improve your financial situation? What’s stopping you from improving your life? Remember, I was in the same spot as you are in now! No one but yourself can make changes today! Start believing in yourself ’cause if she can do it, then so can you! Love this article. Living with my wife on a single income while trying to save and invest allowed me to relate to this. I will admit, I find it very admirable what you and your spouse have managed to accomplish. I will agree with you that your mindset is the first step to achieving success. I am so glad to hear that you’re able to relate to this. I know it sounds cliche, but your mindset and how you think will have a huge impact on your results. If someone really believes in accomplishing something, they will do whatever it takes to get there (even if it means going a little bit out of their way)! Nice post. Your #1 tip is the key. You have to stop complaining and take action. Complaining never improve anything. The Millionaire Next Door is one of my favorite books too. I agree that the mindset is the first step and the most important part (hardest one too)! Without it, no one can make it to the next steps! This is a great motivational piece Panda. Being poor is not the issue, believing that you can and will get out of this slump is. The first step to getting out of the slump is believing that you can and have the mindset the take matters into your own hands to make it happened. If you want to become wealthy, you have to have a wealthy mindset. To save any amount of money, the first step is to start with your first dollar, then the second and so on. I’m glad you find this motivational! You are right about forming that right mindset to building wealth.